A Look at the Amazing items found in our Museum! 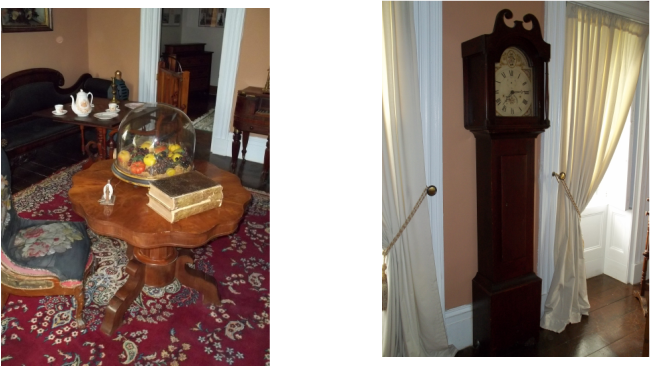 While taking a guided tour you will find each room of the mseum comes to life as we show you different decades and eras. Through each room you will have a sense of what sort of items were manufactured in Cornwall, as well as the way the people used to live, and how Cornwall as well as the rest of Canada has shaped and formed over the years. This page is dedicated to showing you just some of the amazing and influencial pieces that we have in our midst! If this is just a few, you can only imagine the greatness of the other items that are found in the walls of the Wood House. Our temporary exhibit changes often so please contact the museum to see what the room holds with each passing month! The Bedroom, beautiful relics from the 1940s. visit the 'Main Land' to sell their baskets. John Wood served in the 29th Ballalion Varenne's Pharmacy patent, 1867. British Royalty and the British Empire. Cornwall, ca. 1930 Beach its is decorated with in 1951 and Richard Ivens in 1968.
each of her 14 children. Made in Nolan Rupert's workshop be ordered by Eaton's Catalogue. Cornwall Twp. Said to have belonged to "Caribou"
of Cornwall. to Mary Mack. Photo of Walter Wood 1859-1952, "Gathering of the Clans", ca. 1910, Portrait of Willam Mack, 1828-1897.
said to have belonged to John Belonged to B. Harkness of in Cornwall by John Pescod. Sandfield Macdonald of South Lancaster Most likely made in Cornwall City. A Seashell, inscribed with The Lords Prayer, ca. 1900, Skates, ca. 1870, from Moulinette. popular in all of North American and Europe Made by M.A Macdonald during the Rebellions of 1837. 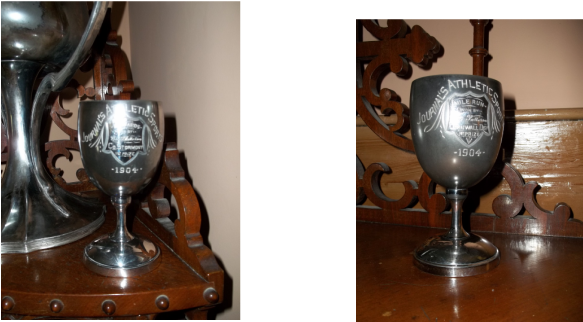 Wine Goblets, 1904, (left) 1st prize to George Patterson, 100 yards, Stormont Co. Journal's Athletic Sports. (right) 1st Prize to George Patterson, one mile, Cornwall District, Journal's Athletic Sports. Hall typewriter, instead room of the White House, Moulinette, "the cream of Highland Whiskies." How about a cup of tea or coffee in the Parlour from 1870? In making this wreath, each seed had to be eight years old in 1844. James Irving who came to Cornwall popular. for Dr. Andrew Harkness in 1837.
lived adjacent to the original 2nd St. W. Family once owned. glue. of the former New York Central Railway station. Our Dinning room from the 1950s and 1960s looks good enough to enjoy a meal in! Mack, dates 1899. Made by Birk's Chair, Cornwall, ca. 1925. Mack around 1903. Ordered from Eatons, cost $7. to Council to Mayor L.G. "Archie" "Canadian Beauty" Renfrew Electric. 1926 Quesnel, B.C., by Mary Mack (Now Logans Gallery, 2nd Street East ) Henry Brault of Cornwall.